Over December 25th, the complete page for the Garurumon & Ishida Yamato G.E.M. Series figure was uploaded to Premium Bandai, opening up orders for MegaHouse's latest Digimon figure set. Previously featured at Jump Festa 2016 and the Mega Hobby 2015 Autumn Expo, the figure is preordering for 11,232 yen, approximately $94 at present. Garurumon & Yamato will ship in July, and are sized to be compatible with MegaHouse's existing Digimon figures. The G.E.M. Series is a line of high quality figures aimed at young adult women, featuring characters from popular anime and manga series. The G.E.M. 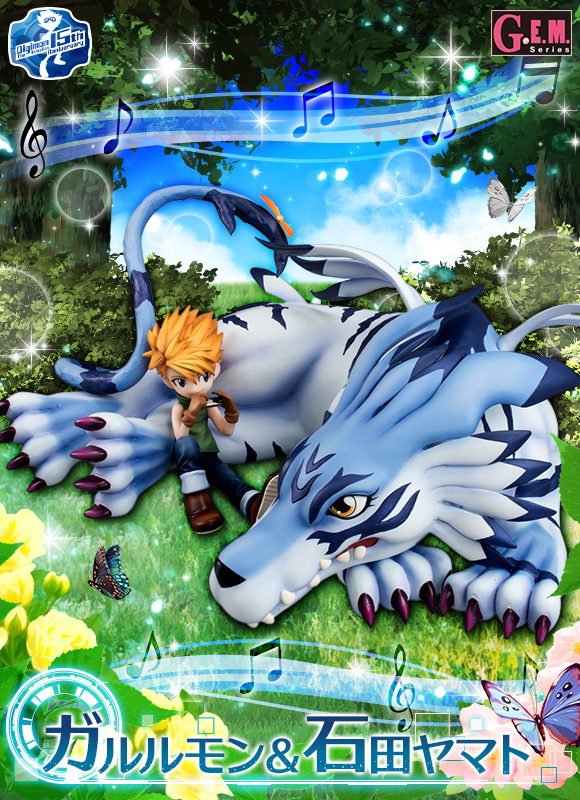 Series has most recently featured Wizarmon and Tailmon from Digimon Adventure, which has been one of MegaHouse's most popular G.E.M. Series franchises since it became a part of the line in January 2014. Past Adventure G.E.M. figures include multiple versions of Takaishi Takeru and Yagami Hikari with the various forms of their Digimon partners, repeated reissues of Yamato and Taichi, and other members of the Chosen Children.